When I got to London, I met up with Ana at the station so we could walk to the venue together. It was at the Conrad Hotel in London where it had been held last year too, so we knew it was a great place and it was nice going back to familiar spaces. We got there quite early met up with Tanya and Abi who were already inside taking some pre Bloggers Festival snaps! It was lovely to have some time before the event hitting of to have a good old catch up, which we did quite well I think! Once it was time to get started, we all pinched a lovely complimentary Bucks Fizz and entered the main hall for brand and blogger mingling! The other familiar brands at the event this year was Natural World who I've also worked with on their Brazilian Keratin hair care range, who were sharing with us their latest Chia Seed hair care range which sounded very interesting. It was lovely to see them and the faces behind all those emails! We also saw Exuviance which we've met at Scarlett's events before too who were sharing their latest body care range. They gave us a body mask to try which I'll be reviewing very soon! I've tried their Cleansing Crème which I'm really impressed with and reviewed here too! 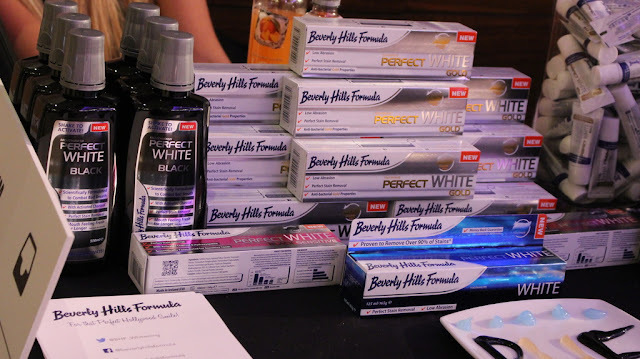 Two brands that were new and I was excited about was Beverley Hills Formula and 7th Heaven. I've loved 7th Heaven for such a long time and I was extra excited when they gave us a bunch of different face masks to try including their latest hair mask and finger masks! As for Beverley Hills Formula, I'd never heard of them until Tanya mentioned their black toothpaste which is supposed to be amazing. I was lucky enough to receive the black toothpaste to try as well as their gold one too! There was one brand I really wanted to make sure I had a chat with and that was the people over at Alflorex. I've never spoken about it on my blog before but I suffer with IBS and it's a constant battle to try and regulate it. After hearing all about their latest IBS medication available in pharmacies and selected Boots stores I wanted to hear what they had to say and what it was all about. I'm really keen to try this and see how it works for me! It would make my life if it works! Lipvir was also a familiar face from the #BloggersBall earlier this year. I don't suffer with cold sores myself but their product allows people who do to prevent it from even happening in the first place! I don't know anyone just yet who suffers with it, but when I do I can give them a sample of this that I was kindly given! There were so many brands at the event this year and if I went on about them all this post would be as long as me! Other brands I did see but didn't manage to photograph was Friction Free Shaving which I cannot wait to sign up to. They're an awesome new brand who do subscription razors from £3 - £8 WITH P&P. Yeah I know right. Basically it's a monthly subscription of razors with a razor for each week so that you never go longer than 7 days with an old razor! I'm really keen on the £5 one, and I can't wait to try the sample box they kindly gave us at the event. As well as them, we met Opies who shared an amazing ginger Christmas cake recipe I'm excited to try and Bodychef who are a personalised diet hamper delivery service. I think that was everyone, but I can't remember... I'm sorry if I forgot someone! The afternoon was an overall success. It was a lot less crowded than previous events which was quite lovely because it was a lot less stressful and sweaty! Last year was amazing too, but it was so packed with people I felt like I was stepping on people's toes every 5 seconds and I was a little stressed about that. This year was relaxing and flowed so much easier! I even met some new bloggers and had a proper chat with them. I Caught up with the Soeurs de Luxe girls, Jasmine and Kirsty ever so briefly and I was really happy to meet Hannah who I'd spoken to on Snapchat a few weeks back and many times on Twitter! I had the best time and there were such funny moments. Like when I screamed at my tweet on the big screen and then the birth of #twoportugueseandaginger hashtag! Yes, me, Ana and Tanya are now #twoportugueseandaginger. Follow our hashtag when we're out and about causing havoc like we did a little at the Bloggers Festival. We gave some of the brand reps new names, guessed their brother's names and probably needed to wind it in a little bit! But nahhhh! We were having too much fun! Ah, is there such thing as TOO much fun!? The night finished up with a live episode of Jeremy Kyle outside the hotel. It was a bit hectic, but it made Ana laugh and smile which she needed after the day she was having. I have to say, this tops all my blogging events! I had such an amazing time and I miss those girls already. 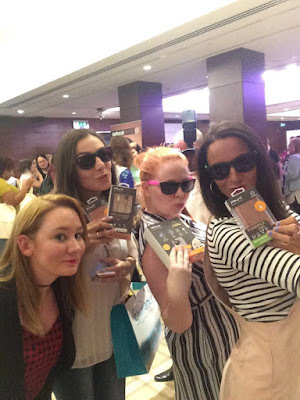 Did you attend the #BloggersFestival this year? Be sure to head back for reviews on some of the things I picked up here this time! I was there too, it was such a great event ! your picture are fab.